Hearty, comfort food at its finest. 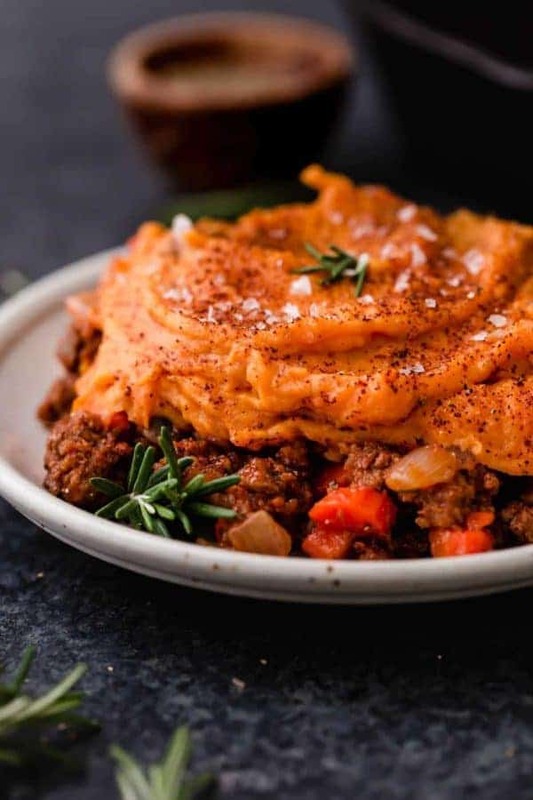 Shepherd’s Pie with Sweet Potato Topping is a family-pleasing, meal prep friendly and an incredibly tasty recipe. 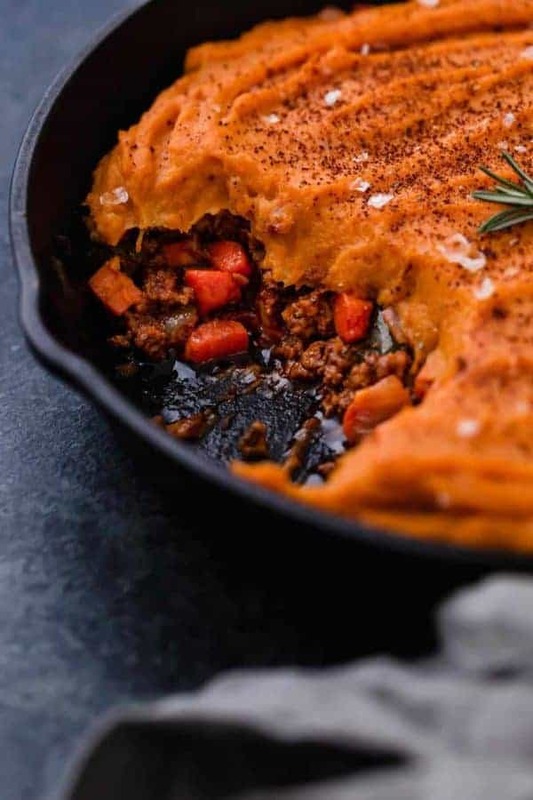 Shepherd’s Pie with Sweet Potato Topping is a recipe you’ll likely make again and again! We shared this recipe a few years back at the beginning of our blogging days. It was a recipe I had created for a cooking class. Those that have been following us for a while may remember this recipe or may have even tried it. Heck, it may even be included in your menu rotation. Well, we’ve updated the photos and are republishing it because it’s just too good not share a second time! This Shepherd’s Pie is one of the most popular recipes on our blog. I mean, you really can’t beat a dish made of hearty, wholesome, comfort foods, right? 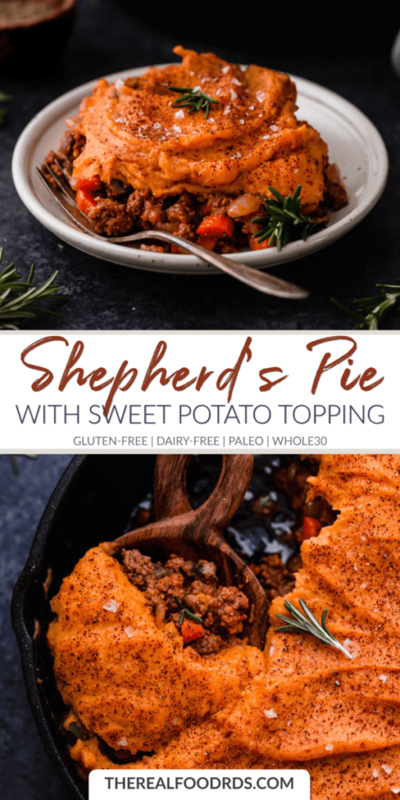 Shepherd’s Pie is made with just a few ingredients, and like many of our recipes the ingredients can be tweaked with what you have on hand or what sounds good to you. For example, if you don’t care for mushrooms go ahead and omit them and add zucchini instead (or another veggie of your choosing). No grass-fed ground beef or ground lamb on hand? Use organic ground turkey instead or maybe you want to make it vegan-friendly. If so, you could try using lentils. You do YOU! Shepherd’s Pie is freezer-friendly, too. I’m all about freezer-friendly recipes. Cooking once, eating twice (or more) is my jam! This dish freezes nicely, so you can go ahead and double the recipe making two 9×9 dishes and freezing one of them for a future meal. No need to do the final baking (see recipe below) with the one you freeze as you’ll bake it the day you serve it. You can even take it a step further by portioning out servings into individual containers (I like these containers). Having a freezer full of already prepared meals makes for easy weeknight dinners. Substitute regular potatoes for the sweet potatoes if you wish. 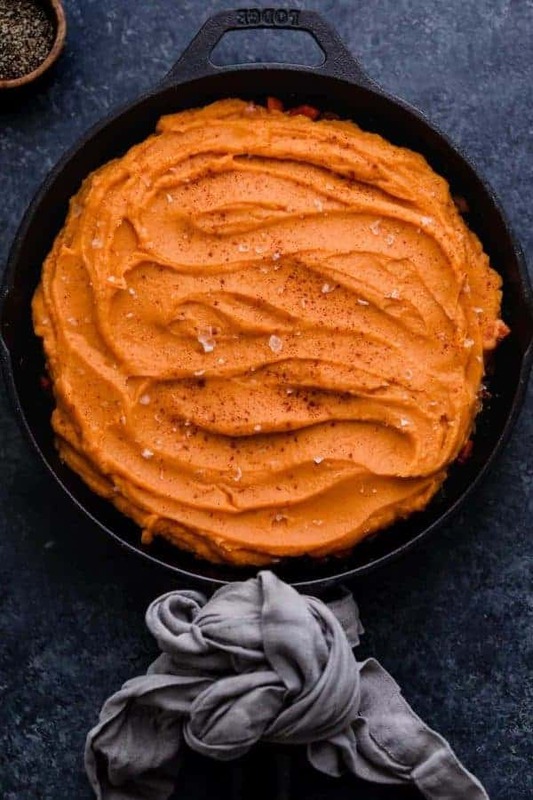 I’m a sweet potato lover, but if you’d prefer a regular mashed potato topping or it’s what you have on hand, there’s no need to make a special trip to the grocery store. Feel free to make that simple substitution. Serve it with a fresh mixed green salad or steamed green beans for a veg-heavy meal. I rounded this meal out with a serving of extra veg. Simply steam up some green beans or whip up a mixed green salad. If you’re looking for a homemade dressing, we’ve got you covered – try our Paleo Ranch or Citrus Vinaigrette with Thyme. 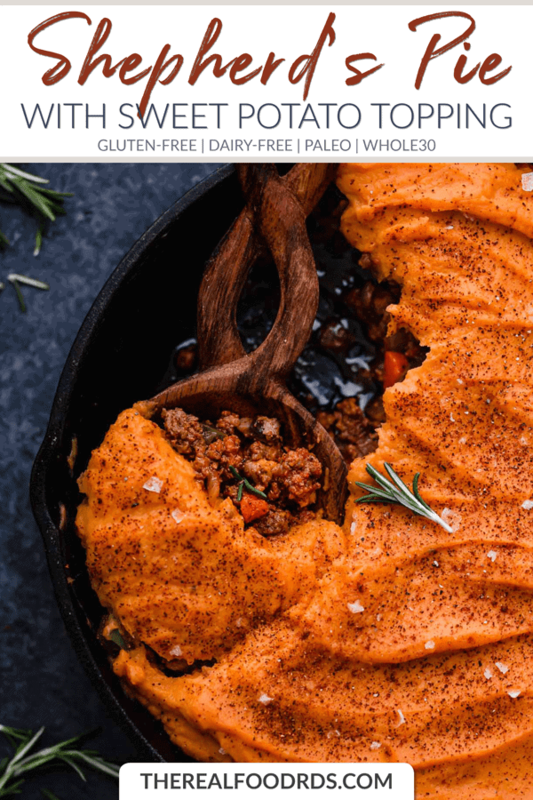 Ingredient Shout-Out: Sweet potatoes – a nutrient-dense carb and one of my favorite foods! High in Vitamin B6 which reduces homocysteine in the blood reducing risk of heart disease. Excellent source of Vitamin C which enhances immunity, produces collagen for healthy skin & bones and promotes healthy digestion. A good source of Vitamin D, which is important for energy and mood as well as bone and skin health. The rich orange color indicates that sweet potatoes are high in carotenoids like beta carotene, a precursor to Vitamin A which promotes eye health and enhances immunity. Rich in anti-aging antioxidants (carotenoids). 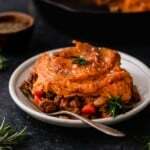 It’s time to give this Shepherd’s Pie with Sweet Potato Topping a try!! A hearty and satisfying meal for the entire family to enjoy. This dish freezes well, so you can go ahead and double the recipe and freeze half for a future meal. Having a freezer full of already prepared meals makes for easy weeknight dinners. Feel free to substitute regular potatoes for the sweet potatoes if you wish. 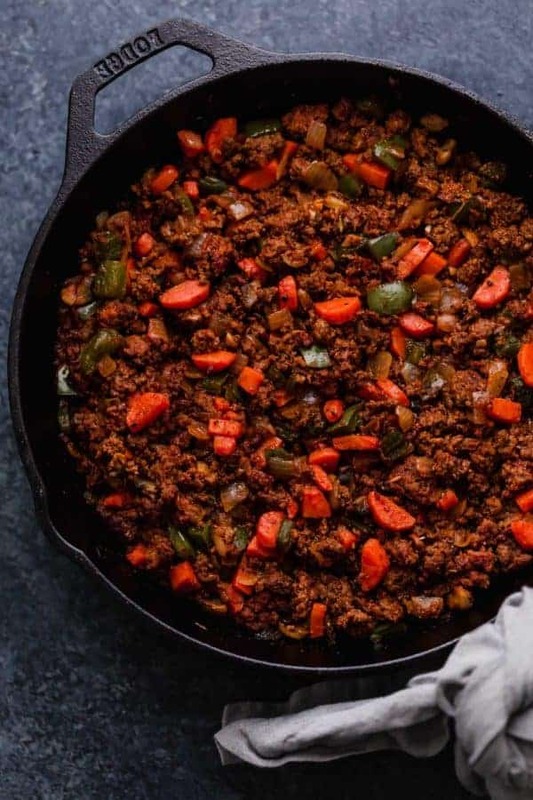 In a skillet on medium heat, add the ground beef, chopped carrots, onions, peppers, mushrooms and minced garlic. Cook on medium heat until carrots are soft, about 12-15 minutes. Begin making the topping while the meat filling cooks. Once the carrots are soft, stir in tomato paste, water, seasonings, salt and pepper. For the topping: Steam or bake (at 375℉) the sweet potatoes until fork tender. Then add all of the topping ingredients to a food processor (or blender) and process until smooth. NOTE: If using white potatoes, we recommend mashing them by hand rather than blending to prevent them from getting pasty. Final step: Transfer the meat filling to a casserole dish (9 x 9 inch dish will work) or 10 inch cast iron skillet and top the meat filling with the sweet potato mash. Dash with sea salt and chili powder. Bake for 10 minutes. Remove from oven and serve. To reheat if frozen: Remove from freezer and place in fridge the day before you plan to serve it. Simply reheat in the oven set at 375℉ for about 20-30 minutes or until center is hot (~165℉). You can reheat from frozen, it will however take a little longer. If reheating from frozen, cover with foil for the first 30 minutes. Remove foil and continue to bake until center is hot (~165℉). This was delicious! I halved the recipe, added some zucchini, used thyme instead of rosemary, and a tiny bit of chorizo as well (basically just used what I had). Thank you!! Awesome! We’re so glad you love it. The addition of chorizo sounds amazing. I love the addition of spinach and mushrooms! I made this tonight, and it was delicious, will definitely make it again! My immersion blender works great for whipping up those sweet potatoes! Love the sound of this recipe! For the freezer friendly version, would you advise preparing it with all of the steps and then placing in the freezer before the final baking process? Then when ready to have thaw in the fridge overnight and place in the over for 15 minutes of baking and then it will be done? Yes, for a freezer-friendly version you’ll want to prepare the recipe all the way through then wrap in foil and freeze (rather than bake). Allowing it to thaw overnight will reduce your final cooking time though it will still take more than 15 minutes to heat through and brown up the topping. You may be looking at 30-35 minutes for that final bake time. Great question! I recently began eating only whole foods and cutting anything processed out of my diet. My husband has not been enjoying this sudden change. That being said, he actually liked this recipe and I loved all of the nutritional benefits! Thank you for the wonderful recipe! This looks delicious! Going grocery shopping in the morning and I think I’ll grab the ingredients for this. What is the purpose of the flaxseed in this recipe? It helps hold the ingredients together. But you could probably omit it if you wish. Enjoy! Hi Stacie..I don’t see flaxseed in the ingredient list…was it removed? It was removed. We did some further recipe testing and found that it wasn’t necessary to hold the filling together. However, if you want to add it, the original recipe called for 1 Tbsp. flax meal + 3 Tbsp. water mixed together to form a gel. This was so delicious! My normally picky husband even enjoyed it! I used my Instant Pot to steam the potatoes while I cooked the rest – so easy! Thank you for the great recipe! Fantastic! We love hearing when our recipes pass the muster of picky husbands!! And great tip for using the Instant Pot for steam the potatoes. I use mine almost daily and love, love, love it! I place the potatoes in a steamer basket inside my Instant Pot (or on the included rack if they’re larger and won’t fall through) then add 1 cup of water or broth – then I select the manual setting under high pressure for 4-7 minutes depending on their size (I also add 15% to the cooking time for high-altitude which may or may not be your case) – then use natural pressure release, about 15 minutes, before opening the vent valve and removing the lid. So sometimes on pinterest you find dinner recipes that sound so good and then you make them and they are okay. This is one of those that sound good, look good and most importantly tastes good. I went whole 30 and therefore my family went whole30 for dinner but everyone loves this *mwuahaha (evil laughter). No eyeball roll from my oldest, no picking around things from my youngest. This was great thank you!! PS: I had whole30 ketchup on hand but no tomato paste and I subbed it in and it worked great! Hahahahahaha! This is awesome. Thanks for sharing your Whole30-but-the-fam-didn’t-know-it win with us. This is a great recipe for life beyond Whole30, too. I always double the recipe when I make it so I can freeze one for another time – just thaw overnight in the fridge (or longer) and bake it a little longer and you’ve got an easy, clean meal on your hands. Saw this on pinterest and it looked oh so good! I got a thumbs up from 2/4 and it was just ok from me. But, I did use turkey, so that’s not fair and actual sweet potatoes instead of yams. I will have to try with beef and yams and come back for a revised review! Always love trying new recipes that nourish my family. Thanks for posting! Thanks for the feedback. Turkey is definitely less flavorful so would love to hear the results for Round 2. Keep in mind, our recipes are designed to be family-friendly so if you like a little more spice then by all means, feel free to add more. What is the purpose of the flaxseed meal and water? I making this tonight for supper but don’t have flaxseed meal. Hi Carol, it’s to help hold it together but you can certainly omit that step if you wish. Enjoy! SO yummy! This is one of my new go-to Whole30 recipes. Thanks, Alexandra! Glad you love it! I find that having a list of go-to recipes really makes the Whole30 a lot easier. The addition of goat cheese sounds soooooo good! Thanks for the idea and so happy to hear you enjoyed this recipe! What type of shredded cheese did you use for the top layer? This was delicious! I’ve always skipped over sweet potato Shephard pie recipes bc they didn’t sound too appealing for some reason . Searching for something to make with what was on hand today and this fit the bill. We loved it! I left out the flax bc I forgot I was out. I wanted it a little saucy so I added a cup or so of beef broth to the filling at the end to deglaze and then added some cornstarch dissolved in water to thicken it. Everything else I followed exactly and it came out great. Thanks! How does the egg white work in replacing the flaxseed? Hi Ariel, it helps to hold everything together. Flax works as a great substitute for eggs because when mixed with water it creates a gel like substance. Feel free to omit the flax or egg white altogether. The Pie will still turn out delicious! This looks delicious but, as a vegetarian I was wondering what to sub for the meat. Would black beans work? Wondering what your thoughts were. You know, we haven’t tried it with black beans though I suppose that would work. You could also add more veggies (onions, peppers, mushrooms, carrots, green beans) and use lentils instead of beans. If you try it without the meat we’d love to hear what you used and how it turned out in case others are looking for a meat-free alternative to this recipe. I made this tonight for dinner. I made no changes to your recipe. My husband and I both enjoyed the dish and will definitely make again. Thanks for sharing this recipe. I am making this right now and I forgot to add the tomato paste ??????? ?we will see how it taste! It should be fine – maybe a little less saucy and less rich but I bet it was still pretty tasty. Sounds good. Slightly confused as I was looking for shepherd’s pie (i.e. made with lamb or mutton) rather than cottage pie (made with beef). You can certainly substitute ground lamb for the beef. Sorry to confuse you! Delicious! Adding this to the rotation! The whole fam enjoyed it. We loved this, thanks! I did double the beef portion (not the sweet potato topping) and I’m glad I did- it fed 4 of us with no leftovers. Granted our two boys are big eaters, but I don’t think it would have been filling enough for 4 with just 1# of ground beef. Also, I sprinkled the beef w arrowroot and after draining off some grease, I added in homemade beef stock to make it more of a gravy. Will def make again!! Oooooohhhh!! I love your idea of using arrowroot starch and beef stock to make a gravy. I agree that with 2 boys doubling the beef is key. I have two young daughters and with my hubby and me there’s usually a small portion left (provided I also serve a big salad and a green veggie on the side). Unfortunately I tried this recipe with regular potatoes and they became a terrible paste in the blender…. Kept everything the same and even baked the potatoes . Maybe I should have boiled them to keep more of the moisture. The likely culprit of the pastiness was the fact that white potatoes contain more starch than sweet potatoes and even this can vary from variety to variety. Thus mashing the potatoes when using white (rather than blending) is recommended. I’ve updated the recipe to note this. Is there a saturated fat count for this recipe? A quick analysis using My Fitness Pal shows there are 7g of saturated fat per serving. I really liked the old recipe with the flaxseed because of the health benefits of flaxseed. I’ve had this site bookmarked over a year and my family loves this recipe. Any way I can get the old recipe? We’re removed the flaxseed for the sake of simplicity and fewer ingredients, plus further recipe testing told us that it wasn’t necessary to hold the filling together. However, like you say – for the health benefits- it’s a great add-in. The ‘Old recipe’ called for 1 Tbsp. flax meal mixed with 3 Tbsp. water to make a gel which you then stirred into the cooking filling. Hope that helps- glad your family loves this one as much as we do! I was thinking the same thing, Rochelle! I was serioulsy questioning my sanity there for a minute. Thank you Jessica for including what the recipe used to say! It is similar however the rosemary and chili powder adds a nice change of flavor when compared to spaghetti sauce. Hope you and your husband enjoyed this recipe! This recipe is what got me and my husband through the Whole30! It’s the perfect meal that doesn’t make me miss noncompliant foods at all. We will be done with the Whole30 in two days but will definitely continue making this! Thank you thank you for such a great recipe!! What temperature do you bake it for? Will try this tonight for dinner. My husband and I completed Whole30 end of October 2016. We both lost 15 lbs. each and since then have tried to eat 75-80% W30 since. I have kept my weight off completely, feel 100% better off all whites and especially sugar. I have to even sweeten my tea here IN THE SOUTH, with just a hint of Stevia. It is a whole new lifestyle for us, but WORKS. We are in our late 50’s!! I hope you enjoyed your Shepherd’s Pie! Thanks so much for sharing your Whole30 victories with us – it sounds like you’re embraced your Food Freedom. Congrats! Congrats on completing your first Whole30 and embarking on #2! We’re so thrilled that you found us and are enjoying our recipes. Can I sub chili powder for paprika? I’m allergic to chili powder ???? and any recommendations for subbing the garlic? Yes, feel free to omit chili powder altogether. You can also omit the garlic or use minced shallots instead. This was yummy! Thank you for another fabulous recipe. I really love the flavors in this dish! The only thing I might do differently the next time I make it is try regular potatoes OR maybe I might just put the filling over a baked sweet potato. Something about the smoothness of the sweet potato was not the right texture for my hubby. But the flavors are great together. I will be adding to my rotation thank you! 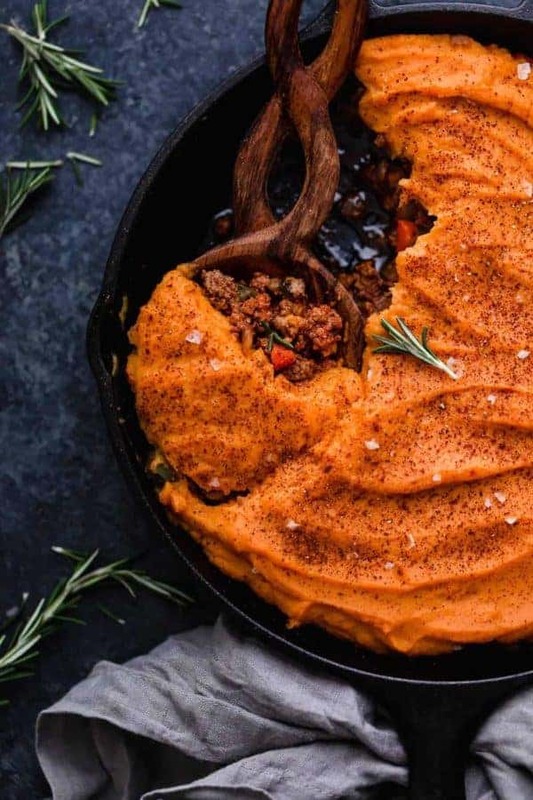 Could I use your cauliflower butternut squash mash recipe for the topping instead of the sweet potatoes? If so, should I omit the sage? Or, if I did you suggestion of a cauliflower turnip mash, how do you suggest I go about preparing it?! You can certainly use the Cauliflower Butternut Squash Mash for the topping for this – and yes, I’d leave out the sage if doing so. As for the cauls-turnip mash option, I’d recommend steaming the turnips until almost tender then adding the cauliflower so they cauliflower does’t get overcooked. Then mash with a little of the cooking liquid and ghee (if desired) and season with salt and pepper. Hi! Can I use chicken or pork instead of Beef? This was the best thing I’ve had on Whole 30!! So hearty and delicious! This was absolutely delicious and so simple! I just finished my second Whole30 ten days ago, but my husband and I couldn’t get enough. I’m so glad that I found this recipe and wish I would have stumbled across it earlier! I might just boil my sweet potatoes next time so that they are a little easier to work with and less prep, but the roasted potatoes worked fine too! I added pecans to my leftovers because I was craving crunchy and that was a great addition! Thank you for sharing! Boiling your potatoes is a great idea – as is using leftover baked sweet (or white) potatoes like I often do. Love the idea of adding pecans for a little crunch, too. This was absolutely delicious and filled the happy belly of my little one with a dozen food intolerances!! Thank you so much! You are so welcome! Glad everyone was able to enjoy it! I did the Whole 30 for the first time in November/December 2017, and this recipe quickly became one of my favorites! One thing I changed from the original recipe…I boiled the sweet potatoes and blended them with my immersion blender & they turned out beautifully. My husband also loves this dish, so it will become a staple in our household. Thank you for a great meal that is healthy and easy to prepare! I’m so glad that this recipe has become a favorite at your house. Thanks for the tip of using your immersion blender to puree the boiled sweet potatoes. So glad you loved this recipe! Zucchini is a great swap for the pepper, too. Would love to be able to make this, but I can only see the ingredients…not the actual recipe. I had already bought everything so I guess I will try to figure this out. Please accept our apologies, we are experiencing an intermittent technical hiccup that our team is looking into. Please refresh your browser and if the recipe does not appear you can email us at: info@therealfoodrds.com and we’ll be happy to assist you. I liked it with the flaxseed. What was the ratio of flaxseed to water? It was 1 Tbsp flax meal plus 3 Tbsp. water. I made this and was amazed. it tastes really good and it is easy. Thank you for the great recipe it is a keeper! Thanks for the love – glad you enjoy this recipe! We are dealing with a food sensitivity to citrus. Do you think I could make this without the tomato paste? Would subbing ground flax seed help? I appreciate any advice you can provide! You can leave out the tomato paste though you’ll more of a loose meat texture under the potatoes (which will still be delicious and a lot like spreading mashed potatoes a slice of meatloaf). A tablespoon or two of flax meal mixed with water (1 Tbsp. flax meal to 3 Tbsp. water) will also help bind the filling together. I make this EVERY Whole30 I do. I freeze leftovers into individual portions for lunch/dinners. I even look forward to eating this when I’m off W30. It’s SO good! I’m with you, Tracy! I ALWAYS make a double batch and it’s one of the few meals at our house that everyone can agree on! This was super yummy. I only had ground turkey but it was still fantastic. My 19month and 4 year old gobbled it up and wanted seconds!!!! Now we will see if the hubby and my other 2 kids will love it!!!! Great recipe, thanks for sharing!!!!!! A little late to the game but I felt compelled to share I made this last night and absolutely loved it! I added some chicken sausage and all the veggies I had in my fridge and a cup of beef broth/corn starch and water to make it more saucy. 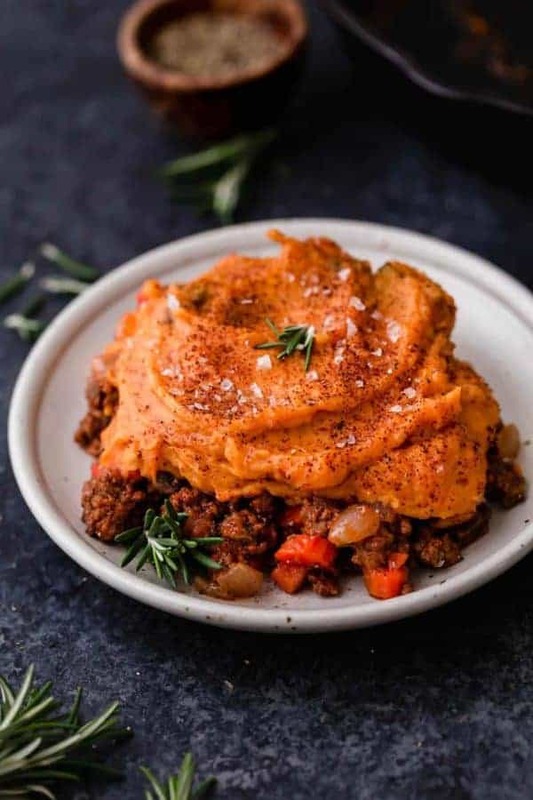 The only thing I will do differently next time is spice up the sweet potato mash before baking as i like it more savory and found myself adding salt/garlic/chili powder as I was eating. This is a new staple in our whole30 meal plan for sure! So happy to hear you enjoyed this recipe! And yes, feel free to spice up the sweet potato mash a bit to suit your liking! Made this tonight for the hubby and I and we both loved it. I did add shaved parmesan cheese on top to serve. So very good we will be making this again. How long do you cook this if it is frozen? To be honest, I’m not certain. I usually thaw it out overnight and then bake it from that point. This is a great recipe. I substituted haricots verts for the peppers. Even our friend who thought she hated sweet potatoes had two servings! LOVE THIS! Thanks for sharing your feedback! My daughter-in-law loved this when I made it after her second child was born and will make it in the next couple of days now that she has had a third baby. We can’t think of a more comforting and nourishing dish for a new mama and her family. Congrats! If I wanted to make ahead, could you prepare all and have ready in fridge to pop in oven? Or would you suggest pureeing sweet potatoes just before baking? Could you even prep a few and freeze in pans to bake later? Would love some tips here! If you want to prep this ahead you can make it up to the point of baking then either refrigerate or freeze. If you baking from refrigerated, just allow it to sit at room temperature while your oven preheats. You may need to add some extra baking time. If baking from frozen, allow it to thaw overnight (or up to 2 days) in the fridge then cover with foil and bake – again, adding more baking time as needed, until it hot throughout. The amount of extra time you’ll need will depend on how frozen it still is when putting it in the oven. Hope that helps! Ground turkey or chicken work? Yes, either of those will work. This was very good!! I used red potatoes instead of sweet and added 1/4 cup frozen corn and 1/4 cup of frozen peas. This is a keeper recipe! Really delicious and loved by my whole family. I doubled the recipe so we’d have leftovers! I used ground turkey, but will use ground bison or beef next time to add some more flavor. Thank you! If using lentils, how much do you think. I would use 1 1/2 – 2 cups of cooked lentils. I have made this three times and love it. It freezes so well (I cut it in servings before freezing and just put it in the microwave w a tiny bit of water in the bottom of the dish and a cover on the dish.) )In the topping I do not put either the ghee or coconut oil- just the sweets and some cinnamon and really it is delicious. Awesome! So great to hear you love this recipe! Do you have to drain the fat once the meat is done cooking or do the carrots and other vegetable absorb it while they cook? Thank you! I do not drain the fat when I make this recipe. If there is quite a bit of excess, you sure could but I don’t think it’s necessary. This was delish! I added 1/2 tsp of cinnamon to the meat mixture and I added plenty more cinnamon to the sweet potatoes. Who would have knew how well chili and cinnamon pair together ! Sounds amazing!! Love the addition of cinnamon!